Joseph Williams has lived in Colorado all his life. In the past years his love for the Hebrew language has grown immensely. He always had a desire to go to Israel, but really didn't think it would ever happen. In 2011 the first opportunity arose for him to go to Israel with a volunteer organization. During that first visit to Israel he began to feel an intense desire to learn Hebrew. As soon as Joseph got home he started using Rosetta Stone, he finished that course in about a year, and from there started seeking any other possible way to learn Hebrew. Since then he's been actively studying Hebrew with friends, watching Hebrew movies, and speaking with Israelis. Joseph has been to Israel 6 times, and hopes to go many more times. While Joseph was able to learn from all of these varied sources, he wanted to be able to point Hebrew enthusiasts to a good, inexpensive course that started at the beginning. Teaching classes, in person and online, gave him experience in helping others to understand the language he had developed such a passion for. Joseph is not a native Hebrew speaker, but feels that this gives him a teaching advantage in some ways since he understands the usual struggles that English speakers have in grasping the Hebrew language. Some of this knowledge comes from his own struggles when starting to learn Hebrew, and some of it comes from teaching Hebrew for the volunteer organization that he first visited Israel with. Joseph was inspired to write Hebrew from the Very Beginning because of his own struggles to find Hebrew instruction that really started at the very beginning, and didn't jump ahead too quickly. Hebrew from the Very Beginning Book 1 and Book 2 are both available for purchase, and he is currently working on writing Book 3. Joseph has taught Hebrew for the volunteer organization called HaYovel. Every winter since 2012 they've held an intense Hebrew study course that he's been privileged to teach at. Every year he's inspired to continue his own studies and even more so to encourage and help others to learn the amazing Hebrew language. He has taught Hebrew in classroom settings with up to 25 students (from all age groups), and also via online collaboration programs. 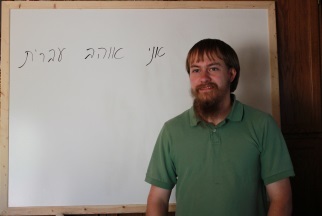 Joseph especially loves helping beginners get started with Hebrew, because he knows how hard that part is on your own. For the past couple years Joseph has also been blessed to teach Hebrew for an organization based in California called Growing In Torah(GIT). GIT is a youth training program that starts with the beginning of the growing season in March and ends in the fall with the Feast of Tabernacles harvest festival. Hebrew is one of the subjects that the students learn on a daily basis.